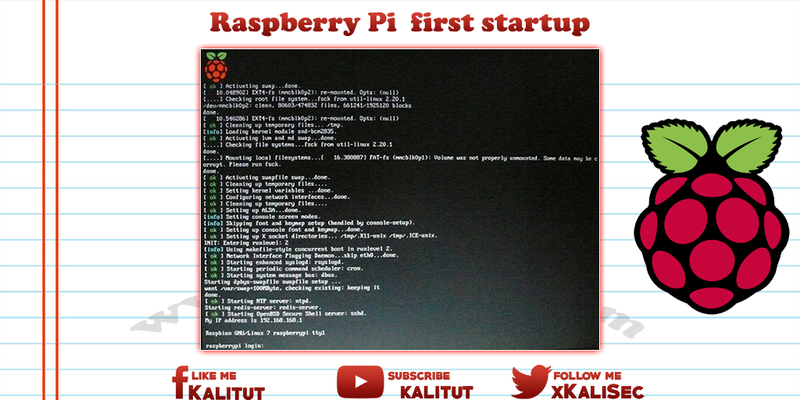 It's about what to do to get Raspberry Pi up and running successfully the first time. As a rule, a Raspberry Pi will be used for the first time with a screen and keyboard. All you need is an HDMI screen as it is now commonplace. Alternatively, you can also use a flat screen TV. They usually have an HDMI port for players and set-top boxes. Then you need a USB keyboard and a USB mouse if you want to use the graphical user interface. First, insert the SD memory card into the slot on the underside of the board. It should be ensured that the SD memory card is completely pushed into the slot. For most models, the card is just stuck. Other models have a latch mechanism. Connect the monitor to the HDMI port and turn it on. Connect keyboard and mouse to the USB ports. Connect the wired network to the RJ45 socket with an RJ45 patch cable (optional). A Raspberry Pi has no power button. He goes up as soon as he gets power via USB power supply. So he is to turn on by connecting a USB power supply. Raspberry Pi then starts by itself and loads the operating system from the SD card. Occasionally it happens that Raspberry Pi does not want to go into operation despite all the right steps. Here only helps to get to the cause of the cause step by step. Typical errors include unsuitable power supplies and memory cards, as well as defective or incorrectly written memory cards. If the screen was recognized correctly, a screen should be visible within a few seconds. Depending on the operating system and preconfiguration, the graphical user interface may or may not start. In the latter case, commissioning will stop after the status messages at login. When logging in for the first time, use "pi" as the user name and "raspberry" as the password. After the initial start-up of a Raspberry Pi you should make a basic configuration before going into possible installations and configurations.